Opening/Synopsis: “My name is Otis. I used to be the happiest kid on the planet! This is a picture of my family and me…the way it used to be…This is what my family looks like now. My mom won’t even talk to my dad, and my dad won’t even talk to my mom.” Otis is so upset that he can’t even say the “D” word — divorce. His parents use Otis as their messenger and spy. Otis tells Gram that he feels like “it’s all his fault.” She wisely tells him he didn’t cause the divorce and he can’t control what is happening between his parents. Gram says they’ll still be a family, just a different kind of family. Otis finds a way to adjust to the divorce. Why I like this book: As many of you may have guessed, I am a huge fan of Julia Cook’s books. Divorce is upsetting for children and they don’t know how to do deal with their feelings. Cook has written a very helpful book for children, families and educators. Cook, a former teacher and school guidance counselor, often heard students comment that they were the cause of the their parent’s divorce. She came up with three reasons that are very reassuring for kids going through a life altering divorce. This is an excellent book for children to understand that they aren’t the reason and what they can do to help themselves. And it is a guide for parents on how to deal with divorce with their kids. It’s a family book. Phillip Rodger’s illustrations are priceless. They are colorful, expressive and emotive. They capture the tone of her story. 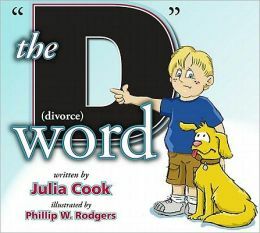 Resource: The book is a resource on how to successfully deal with divorce. There is an introduction in the beginning from Julia Cook. She has a list of three C’s of divorce that she uses with children: I did not Cause it. I cannot control it. I’m going to have to learn to Cope with it. She also offers survival tips for parents. Visit Julia Cook’s website, to view the many books she has written.